$57.99 & FREE Shipping on orders over $59. The famous forward-sealing Perlick beer faucet, with the added feature of an integrated Flow Control valve! 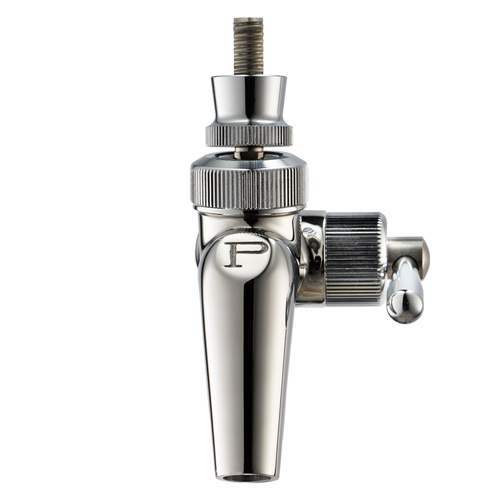 Manage foaming issues when dispensing beer at home with this Perlick 650SS Beer Faucet with Flow Control. The new flow control feature makes it easy to reduce foaming no matter the type of beer line you’re using; leaving you with a nice, tall glass of crystal clear beer. Constructed of 304 stainless steel to last a lifetime. Buy two or more 650SS faucets from MoreBeer! and receive free shipping in the lower 48 states! The #1 feature of the Perlick faucet is its forward sealing design. Why is that so important? An ordinary, rear-sealing faucet closes by pushing a shuttle against the faucet shank, at the rear of the faucet. So once the tap is closed the faucet is still full of beer that has to be drained out. There is actually a pin hole in the back of an ordinary faucet that allows beer to drain. Because of this design, leftover beer residue inside the faucet makes operation sticky and can harbor bacteria which harm your beer’s flavor as it flows through the faucet. In the Perlick faucet, with its Forward Sealing design, beer only has to drain from the short 1" nozzle section. This allows it to always operate smoothly (even when it was not cleaned between uses) and greatly reduces contamination!. great for higher carbonated beer. It is a birthday gift for my son who makes beer. I often fill growlers so I need flow control. I am having trouble with the Intertap flow control faucets. I have two of them already and they work well. Nice to slow the flow for growler fills. To use w / adapter for direct pour from corny without foam (hopefully). Adding another tap to my keezer, so now I have 5. Using these exclusively. They work great! Great flow control for highly carbonated beers/ciders. chosen for fellow beer maker at his request- he felt it is quality! I have over carbed beer that is hard to serve. Edgestar Kegerator faucets handle gets stuck very easily. Wish I would have know this when i ordered it and i would have gotten the proper faucet up front. What is the best shank for this, I heard the 3" cant be used with it. the convex part that the faucet links up to is fairly shallow. This means you can’t use them for a perlick flow control faucet.? is it compatible with Perlick Faucet With Flow Control (D1221)? Stainless Beer Faucet Shank - 2 in. BEST ANSWER: Probably not. I recently ordered several of the 3” stainless shank. Assuming it’s the same design (except the length) it will not work. The convex sphere thing in the back of the faucet that controls the flow interferes with your ability to fully tighten the faucet into the shaft. Beer. Everywhere. Do not buy that shank if you’re trying to use with a perlick flow control faucet. Works with a Perlick 650 faucet? BEST ANSWER: They worked perfect for mine. After experimenting with this faucet I am sold. Will replace my other 4 630 SS taps. No wasted beer regardless of the level of Co2. Belgian beer friendly. Love the Perlick 650ss! I have 3 on my keezer and would recommend them to anyone. Super easy to break down and clean. The flow control is a no brainer! Don’t know if I’ll ever buy a faucet without that option ... think I’m spoiled now! Glad I went with these. I bought a kegerator and switched out the ones it came with to have the perlick. It just gives you options for different style beers. You still probably need to balance lines but this is just one more fine tuning tool. Can't find compatible shanks. Faucets is left to lie idle. 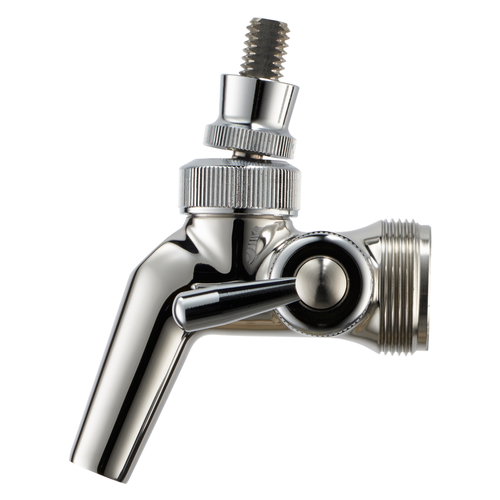 Hello Igor - Product SKU D1247 Intertap shanks are deep welled to accommodate flow control faucets. Best faucets money can buy. They can be adjusted for a perfect pour every time, for any kind of beer. Once they are set up, they run through the whole keg perfectly. They are designed to be really easy to keep clean. We are only one week with these new faucets, yet we are already seeing a huge difference in product loss. Quick shipping and they work great! This is a Quality piece of equipment! Shuts off completely with only one drip. The flow control allows you to fill growlers directly from the faucet. It can also be used to adjust the rate of flow if your system is out of balance. Throw all of those cheap faucets away and get this one. You won't regret it! Best tap on the market! Better than my stock faucets. The flow control is nice. these babies never stuck like normal taps. totally recommended. While it doesn't replace a lengthy beer line is does help slow down pours. Flow control is worth the extra $$. Awesome faucets. I had four Perlick 525ss that periodically would leak. After three several gallons mistakes on the floor I decided to change faucets. I had already replaced the o-rings in the old faucets. I chose the 650ss for the flow control but also they provide a second shutoff. I have been very happy with them. Open and close is smooth. I purchased this faucet to help with control the excessive foaming i have been dealing with while trying to pour a pint. This works perfect. Now i dont have to pour more beer then i intended and wait for the head to settle. The flow control option is great and allows tremendous control of foam, etc. when pouring. It also allows higher CO2 pressure as appropriate for one style while pouring another effectively. Definitely worth the money. 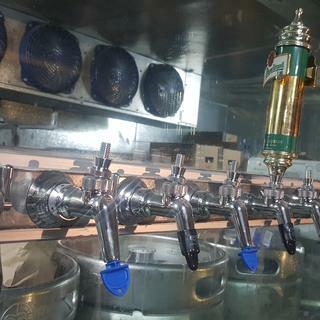 Been serving beer or cider out of a tap for over 10 years. So sad I waited this long to upgrade. Now just to resist the urge to buy 3 more right now so my wife can buy them as a gift later. I am so happy to not get too much foam on the first mug I fill. Previously, the second pour was ok, but the first one was too foamy. I like the adjustable flow, which allows me to use a bit shorter beer lines on average. Not only do the flow control levers work great and eliminate the need to adjust your hose length, but they also work as a safety lock! There have been several occasions where I or someone else would accidentally bump the tap handles and turn the faucet on without any glass under it. Since I make sure I turn the levers down (off) after every pour, there's no need to worry about accidental spills. With longer tap handles (i.e. 12"), it doesn't take much force to accidentally turn them on from a bump. Hey, these are amazing. Adjust flow at the tap while pouring. Perfect. Over carbonated? Warm beer line? These mitigate the foam production very well, so no need to toss first pour. As beer fills glass and flows better, just adjust back to full flow in while pouring! 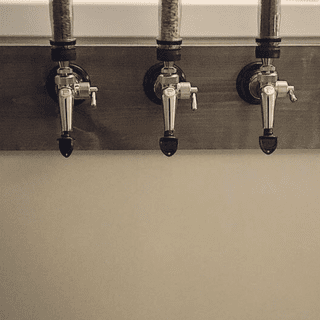 I used 2 of these taps for a couple years with a good amount of success, though I'm not really sure that they reduced any foam on high carbed beers. They were also a pain to clean and put back together tightly - somehow the fittings and gaskets never seemed to line up properly without many many tries. The issue that ultimately made me get rid of them, and replace them with the standard 630ss perlicks, was that they will absolutely clog up with any hop particles in your beer. So for any dry hopped beers that still have some hop sediment or leaf particles, they are a nightmare and will plug up like a cork on the flow control valve. Not worth the time and aggravation. Bought these specifically for serving my more highly carbonated brews while avoiding foaming issues. Even when used in conjunction with longer, narrower tap lines these taps still create significant foam in brews conditioned to 3.0 to 3.4 volumes of Co2. Good for pouring samples of normally carbonated beer though. Why don't more makes/models of these exist? It's great being able to fine-tune of the amount of foam right there at the tap, using a control that's a few inches away from the faucet handle, on one's kegerator. No need to change regulator pressure, fiddle with different beer line lengths or even open the fridge up. What a novel idea! I have one and only one minor complaint: the handle has some side-to-side play, even with everything tightened. I was hoping for a more solid feel in the operation of the handle. If it hasn't been poured from in a while (more than an hour or so) the first opening produces a weird foamy dribble before turning into a perfect smooth stream. Spraying up inside the closed faucet with a dilute solution of Star San/drinking water to clean and moisten it before the first pour eliminates this issue. Get this for your kegerator; you won't regret it. In terms of getting the right amount of head, it makes pouring the best possible glass of homebrew ridiculously easy. The flow control Rules! Get it and you will love it! No leak, only a couple drips when you close the valve (show me a faucet that doesn't drip). I love this product and will only buy these taps in the future. These faucets solve two of the most vexing problems for home kegerators, foaming and faucets that stick. I have a two tap setup where I usually run a "light" and a "heavy" keg off a single CO2 tank. The flow control allows me to dial in a great pour off each keg without excess foaming. The front sealing feature of the Perlick line means no residue buildup and the sticking that can occur if you don't use them on a daily basis. I bought a wopping six of these for a kegerator I built, with great reviews everywhere. Here's what nobody tells you -- they are SS but the critical internals are not very tolerant of anything acidic -- meaning they let out a massive sulfuric stench (rotten eggs) if you attempt to run starsan through them. It probably took a few hours to figure out why my brand new SS and wine certified (according to Perlick) parts were reaking!!! Unfortunately, it's the two most intricately cut parts (the ball, and the flow control inner piece) that are probably (guess) infused with sulfer to make them easier to make. The flow control indicates its the right piece as this is the only flow control faucet. I would NOT try wine or cider in these. For beer, I'll run PBW and water through them, then use a picnic tap to starsan the keg. The flow control is great though. Would I but them again, maybe as id rather just use starsan through it all. For tasters and foam control though, its great so its a tough call. Its probably best to be informed before purchasing, but with proper usage (no sanitizer) they work great. I've run star stan through perlicks for years... Never had this, or any, issue. I don't soak them for days, but, basically, I use what is handy for cleaning lines, rotating alkaline and acid based cleaners and sanitizers. I have seen star san eat up chrome plated connections, though, so it is entirely possible. Just never seen it in the 15 years that I've had perlicks. Good control w/ variable carbonation. I got this so I could vary the carbonation and still pour w/o getting a glassful of foam, or having to change out beer lines. It works pretty well, but I could still overcarbonate and get excess foam. It works, but does have limits. Also, don't use it with a "chunky" beer. I tried using it w/ a ginger ale that had lots of pureed ginger, and it immediately clogged up. I haven't got to get this installed yet, but from my past use of Perlick products I'm sure it's going to be great. I am still working on the kinks for this faucets, but I use it regularly. I only with I didn't have to change out the growler connector, as my original one does not work with this faucet. Works great. Lets me set pressure for carbonation level without huge lengths of beer hose. And having ability to shut it off is a great bonus. This is what you wish you bought after purchasing the lesser stuff. I did it right the first time on my keeper build, consider doing the same for yours. I too use it to serve directly from my keg. I can get a perfect poor every time. I will eventually replace my Perlick faucets on my kegerator with these. Love these. Replaces some chrome faucets. I often have high carb and low carb beers. These allow me to manage the foam and flow to have perfect pours. I thought I needed to buy a longer draft hose and then saw this. Ordered it and it worked perfectly. I'm writing this review now as I go and purchase another one. My other faucet is no comparison and doesn't allow me to tune the pour. I definitely recommend this product. Instead of messing with beerline lengths and faced with pouring different styles under same pressure I decided to try a couple of these faucets and they are great! Also perfect for filling growlers or sample glasses with a nice slow pour. With the flow control, you can quit worrying about line lengths. Plus, it allows one to shut the faucet all the way off so that even if the handle is inadvertently bumped, no beer will flow. Bought 4 of these so far, planning on getting more for an upcoming event. I purchased a couple of these to replace the faucets I had connected directly to the ball lock keg adapters I have. In this configuration there is no hose to provide the back pressure required when keeping at serving pressure, and the standard faucets provided nothing but foam. If you lower the pressure to compensate it will eventually go flat. Using the flow control I can pour a perfect beer directly from the keg regardless of pressure (although slower). An important note though - they do not work with all the faucet ball lock adapters out there. They require ones with a little deeper well behind the faucet for the adjustment to work. Where did you get that adapter? I would love to have one. Why ruin your labor of love with a bad pour? After all that goes into making a good brew I got tired of the pour altering a good presentation. Particularly useful in a multi draft system you can now match the draft line resistance to the beer style and achieve a perfect pour of your low carb Irish red next to your effervescent pilsner. Great Product - Get It! It just works! Easy cleaning, all stainless steel product. A must have if you're serious about draft dispensing. Worth the extra you pay for it. Yes it does cost more but this faucet is awesome. It does it exactly what it says. Allows you to control the flow. Highly recommended. I was on the fence about spending the extra money, but I'm glad I did. This is easily the best of my 4 faucets. It pours great every time. I can even pour while force carbonating to test CO2 levels without an issue. I use two of these in my jockey box. When I'm out pouring the last thing I want to worry about is messing with draft systems and swapping out different hose lengths for different beers. The flow control allows you to dial in your pour right at the tap. Well worth the extra money. This has been the best addition to my kegerator, trying to narrow down over-foaming issues for ages. Longer lines can help, sure, but won't take care of every style, especially styles that are higher carbonation. This has made things way simpler for me, as I can now serve any style, any time and just adjust the flow from the faucet. The only complaint I would have is that, at any given setting, it does seem to flow slower than my regular Perlick at the same PSI, etc. But given that this always offers me a better pour, it's hardly a problem.